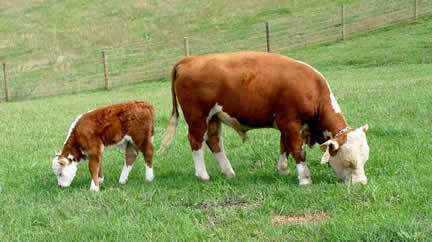 The Hereford cattle breed was first started 250 years ago by the Tomkins family in Herefordshire, England. In the late 1960s, Point of Rocks Ranch in Fort Davis, Texas used certified dwarf-free Hereford bloodlines to create the Miniature Hereford cattle we know today. By 1989 breeding stock was available for sale. Point of Rocks Ranch still maintains 11 separate bloodlines to ensure a sufficient genetic base for breeding of the Miniature Hereford. By having this new cattle breed, it is thought that the beef cattle industry will become more profitable for the cow/calf producer in the future. 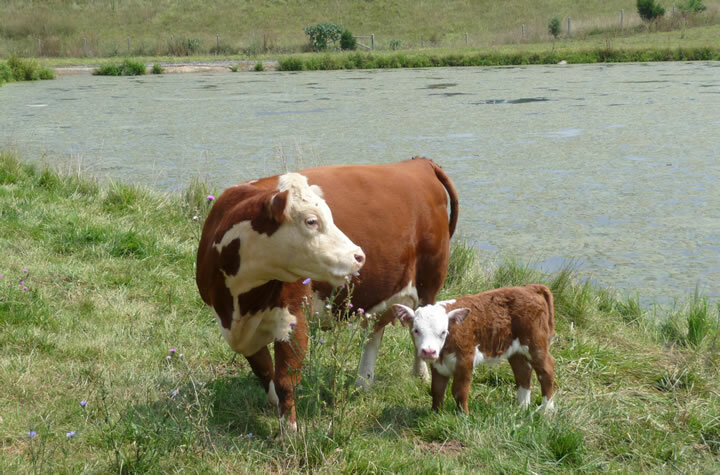 The Mini-Hereford breed is known to be very fertile and breed back in a timely manner. Heifers can be bred at 2 to 3 years, while bulls can start earlier, around 1 ½ years of age. Once a calf is born the mother is very nurturing and also provides plenty of milk for its calf. The average weight of a newborn mini calf is 35 to 60 pounds. Even though the Mini-Hereford breed was created over 35 years ago, there are still very few in the world today. This gives the long-term breeders market unlimited potential to expand, increasing the ability to sell their cattle. 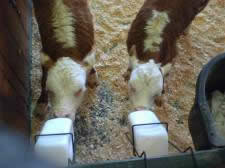 Also the smaller sized cattle are great for those who don’t have the time or the land for a full scale farm. Two to three miniature cattle will eat as much grass and feed as average full sized cattle, which is why 5 to 20 acres is perfect for them. Whether you are moving from the city to start a farm or if you already operate a farm and just want to embark on a new type of farming, minis could be the right type of livestock for you. Some farmers enjoy them as a hobby and may even want to begin raising them into their retirement for income. Minis can also serve as a valuable tax incentive for your property. If you are looking into selling your cattle for beef, minis are great because they produce some of the most tender and best tasting meat you can get. Minis provide a smaller amount of beef for a single family to consume within the recommended freezer shelf-life; one man can easily hang a quarter of beef and process it himself. They make great children’s 4-H or school FFA projects. 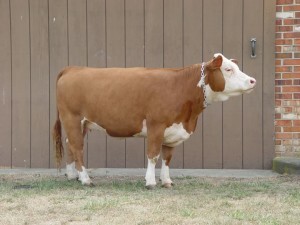 Miniature Herefords also make wonderful show cattle in competitions nationwide. Because the mini can adapt well to a variety of climates, this allows the farmer to expand his marketability. Everything about the Miniature Hereford breed is great, they have no down side so investing in them would be well worth your money. 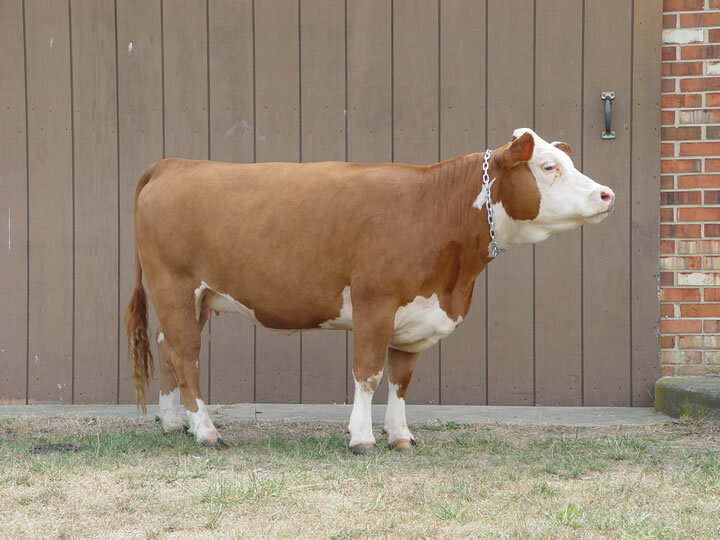 The American Hereford Association (AHA) is the official registry for Miniature Herefords. True Miniature Herefords registered through the AHA have pedigrees dating back 100 years. By having the cattle registered through this association, the purity and bloodlines can be traced, and help a breeder with the predictability of offspring. For a bovine to be classified as a “miniature” they are scored by frame. Most Miniature Hereford frames range from 38 to 43 inches at the hip. The charts below explain the frame scoring for the Miniature Herefords.